Our cells have many defenses against viruses. When cells are infected, they build enzymes that slow protein synthesis, and thus also slow down viral growth, and they build enzymes to chop up double-stranded RNA, which is made primarily by viruses. Infected cells also alert the immune system by displaying pieces of the virus on their surfaces. In the worst cases, infected cells make the ultimate sacrifice and destroy themselves by apoptosis. Of course, our cells can't normally be doing all these things--these draconian measures need to be initiated only when a cell is in trouble. Interferon is the way that cells signal that it's time to shift into virus-fighting mode. Interferons are secreted by infected cells to warn their neighbors, and once stimulated, cells of the immune system secrete interferons as part of their viral surveillance. Interferons are small proteins that bind to receptors on the cell surface. This signal is transmitted into the cells and leads to production of hundreds of proteins involved in viral defense. Several types of interferons are made by our cells. Interferon-alpha and interferon-beta, shown here from PDB entries 1itf and 1au1 , are the most common types, and are made by most types of cells, especially cells of the immune system. They send a basic signal to stop growing and focus on defense. Interferon-gamma, shown here from PDB entry 1rfb , is secreted primarily by T-cells, and sends signals that tune the response of the immune system. When interferon was first discovered, it seemed to be the perfect treatment for fighting viral infection. Since it also slows down the growth of cells, it also seemed like a perfect treatment for stopping the uncontrolled growth of cancer cells. Interferons are very specific, though, and only interferon from human cells or other primates is effective for treatment. So widespread use and testing needed to wait until the 1980s, when methods for genetic engineering progressed enough to allow production of recombinant interferon. Today, recombinant interferon is used to treat hepatitis and other viruses, multiple sclerosis, and a few types of cancer. However, since it has such an extreme effect on cells, it causes significant side effects, and it is currently only used in specialized cases. 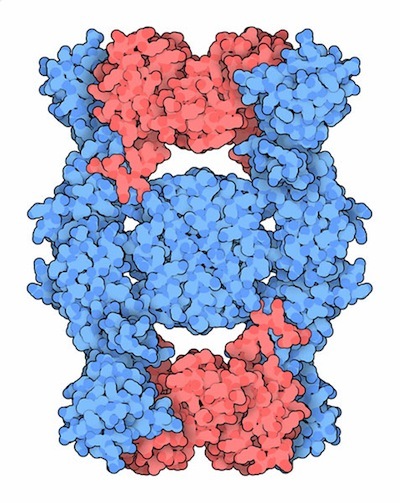 Viral interferon-gamma binding protein C4R (blue) bound to interferon gamma (red). Viruses are tricky, and as you might expect, they have evolved many ways to fight the protection that is elicited by interferons. Different viruses block different steps in interferon action, all the way from the binding of interferon to its receptor to the cascade of signals that ultimately reach the nucleus. 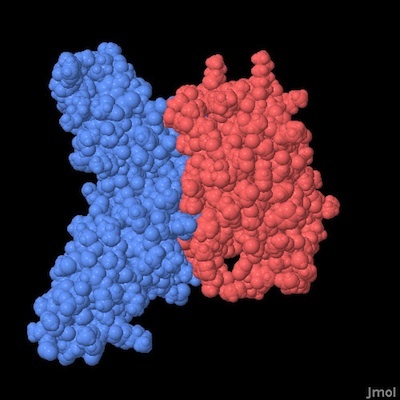 For instance, the protein shown here (PDB entry 3bes ) is from the virus that causes a smallpox-like disease in mice. 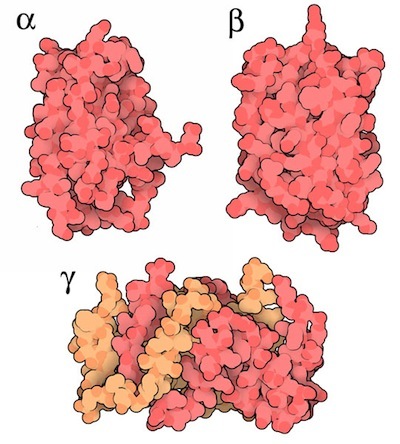 It traps interferon (shown in red) and prevents it from binding to its receptor. As with many other signaling proteins, interferons bring together two copies of a receptor to initiate the signal inside the cells. Interferon-gamma is a dimeric protein, and two copies of its receptor bind on either side, as seen in PDB entry 1fg9 . Interferon-alpha, on the other hand, is monomeric, and two different receptor chains bind to different portions of the protein. PDB entry 2kz1 shows the interaction with one of the receptor chains. Click on the images above for interactive Jmols of these complexes. Interferon-gamma forms a domain-swapped dimer. 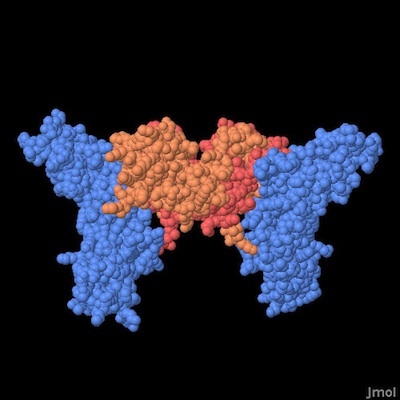 You can see this by comparing the folding of the chain in structures of interferon-alpha and interferon-gamma. The PDB includes several other viral proteins that block interferon action. Can you find them and determine how they attack the interferon process?